They Don’t Teach Dental Business in Dental School – Why Not? They Should!! I’ve often wondered why they don’t teach dental business in Dental School. I wonder whether it’s just brushed over on purpose. You see the majority of dentists operate in private practice. A cottage industry. But they graduate with little or no formal business training at all. So, let’s take a look at the dynamics of running a dental office. In simple terms. First and foremost, the dentist needs to be a clinician. He needs to be able to fix teeth, and help the public with their dental issues. For this or for these services, he is to charge a fee. And from that fee, or those fees collected, he is expected to sustain a business. 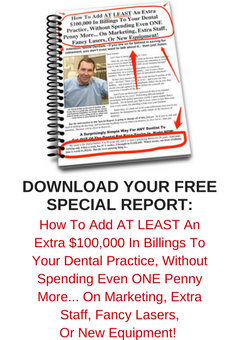 The fee charged, or moreover, the total fees gathered in the dental office, are meant to do three things. Sustain the business. Pay the bills. Keep the business solvent. Pay the dentist. Pay him a wage, salary or a contract fee for performing his surgery. Return a dividend to the business owner for the money invested in the dental office. Keeping the business solvent is a far greater equation or process than just running the business at a profit. The business is a conglomerate of numerous intricate parts, and as a business owner, all of a sudden, the principal dentist is thrust into a maze of confusion and parameters that maybe they never ever expected…. Let me explain. You see, in Dental School, nobody ever really explained *ALL* the components and what they mean, and the interrelations they have. Stock control. Ordering stuff you need. Never running out but not being overstocked. And not buying stuff you don’t need. Dental stock, as well as stationery and non-dental. And not being overcharged or taken advantage of when buying stock ….but *that* never happens…. Plant and equipment. Purchase, service, replacement as needed. Rent and utilities. How much should you pay? Ground floor exposure or upstairs? Advertising. All the different forms of advertising, and getting a competitive advantage commensurate with your skills and expertise. Marketing strategies, both external and internal. Being perceived by the public, as well as by your peers, as being different, in a better way. Human resources. Staff. Team. On the balance sheet wages appear as a cost. But wages, staff, team, are an asset, not a cost. Let’s look briefly at staff, or team. How much do you invest in educating and training? A well run, well-trained team is a huge asset to any business. But how do you manage the components of the team? When there’s more than one team member then there’s nearly always favouritism, or leanings…that’s just the way things are. How do you manage staff or team expectations? How do you encourage progress, but at the same time, not run up too high an overhead on staff? Do you pay bonuses? Do you give annual raises? Or do you give performance based raises? How do you manage a larger crew where “cliques” occur and gossip and chat diminish respect? What about social media and mobile devices, or accessing email and internet during office hours? Is it a Gen-X or Gen-Y thing that they just expect to have access during office hours? Do you go for a large office or a small office? How do you choose which type of dental office suits you best? Do you just gravitate to the dental practice you deserve? Without a plan? What if the practice you end up with is not the dental office you started out wanting. Stephen Covey said “Begin with the End in Mind”. I believe this is admiral, but can be difficult. I think you need to build your office so it is a low stress environment for you. That you can manage it well and you can enjoy your time in business. You don’t want to end up being chained to your business. Constantly running it, thinking about it 24/7. Though that’s what often ends up happening. They say being in your business is a full time commitment. Make sure your business returns and rewards you so you have time to smell the coffee. If not, then you’re doing it wrong…. So maybe, you need some outside help…. Did you like this blog article? If you did then hit the like button below. Also, hit the share buttons below and share this blog article with your friends and colleagues. Share it via email, Facebook and twitter!! A few weeks ago I began sharing with you some of the ideas that I have implemented during my practice of dentistry over the last thirty years that have impacted significantly to separate me from “other” dentists in the provision of dental services in my area. I promised you five simple changes that you can implement in your office that will impact immediately on how your clients and patients perceive your dental office as *THE* dental office that cares, rather than being seen as just another dentist. These changes, which I like to call *MAGICAL MOMENTS* are simple to implement points of difference that made my dental office *THE* Dental Office of choice in Parramatta, in Western Sydney, and allowed me to command great respect from the community as being *THE* Dentist to go to. Here’s a Question. I ask you this: In a social setting, have you ever been accused by someone near and dear to you of “being there, but not really being there”? Being present but not really being present? Ever been accused of “not being in the moment”? I know some dentists who like to rant and rattle on to their dental assistants while they work away on the patient below. Kind of like that scene from M*A*S*H* the TV show when Hawkeye is performing delicate surgery but seems to be easily allowing his lips and mouth to be chatting about other things while his hands are saving lives? Well guess what, that’s TV! It’s make believe! Not real!! Don’t even think for an instant that you can. You cannot! It’s impossible to give one hundred percent to your patient while you have your mouth and mind in gear on another topic. And even if you think you can, as a dentist, multitask, think of the message you send to your poor patient laying down there, mouth open, often in a state of fear or terror? I feel very strongly that over-the-patient chat is so disrespectful. On two counts. Firstly, the patient is paying for your time. They should not be subject to listening to something they may not want to hear or may want to contribute to, but cannot, for obvious reasons..…take your pick. At Active Dental, we are regularly complimented by patients on how much they appreciate our level of concentration while performing their dental procedures. This is because once we pick up the drill, it’s “all systems go”, for concentration! We have also developed a series of unique signs that I use that allow me, as the dentist, to request visually certain items that are regularly required, like dry tips, cotton rolls, articulating paper and dental floss, without having to break the “cone of silence”. Patients often compliment us on our level of professionalism during treatment procedures and our perceived [by them] concentration and dedication to the intricate task at hand. The other thing about eliminating banter and maintaining a code of silence is that when we do speak, the patient’s mind is attuned to our voices. What this means is that our silence during treatment then allows our team members greater opportunity to present our “thank you” philosophy in front of the patient. It allows us all to present our courtesy to each other in every request, praise, and piece of gratitude that we utter, and these displays of courtesy never go unnoticed by the patient. Remember, that while the patient is lying flat, their visual range is limited to a dental light and whatever is on your ceiling. This means that they are then more attuned to audio and verbal. So, be “with” your patient. Don’t be “off” somewhere else. Always, when treating and performing dental procedures on your patients, be “in the zone”. Your patients will appreciate it. Is it just me or is dentistry changing in the eyes of the public? This month, what with travel for seminars, conferences and concerts, my three days per week for 4 weeks has seen me treat patients on only half that number of days. So you’d think that appointments with me this month would be quite valuable, right? For instance, in this week I’ve worked only one day available before venturing off overseas for some education. So really there’s now four weeks or so before my next appointments and my book looks pretty darn full for a few weeks when I get back. But then yesterday, not one but two Gen Zers just went ahead and pulled out of significant appointments for this week, that they’d had reserved just for them for some time, with zero notice! Without a care! As if it were simply water off a duck’s back! Which kind of got me thinking, on two planes…. Firstly, I started thinking about dental manpower. In particular, the plight of the contractor assistant dentist. Now if I were working as an assistant dentist, not in my own business, why should I not demand payment for my time for just being there and sitting around? Which brings me to my second point, as a business owner. As a skilled and even more highly educated and trained professional, what is it that these days is allowing the public to treat us like tree loppers or drain fixers whose flyers and leaflets are constantly filling our home letterboxes to overflowing? Because that’s what it seems like to me. There just seems to be this growing lack of respect from the community for the services of dentistry as if it were now just simply a commodity. I’m feeling this more and more as new patient after new patient turns up with an acutely painful broken down tooth in a mouth that politely could really only be called a disaster area and asks simply “What’s the cheapest?” when questioned as to what they’d like to do to get them out of this unbearable discomfort. I’m thinking, that down here in Australia, this public perception has been caused by two, possibly three, significant factors. And secondly, the recent dramatic increase in the number of dentists registered to practice has made dentistry more than ever appear to the general public, to be a commodity. Recent numbers I’ve heard is that in 2012 we have twenty seven percent more dentists registered than we did in 2009, primarily as a result of increasing new graduates and overseas trained dentists entering the marketplace. This increase and continuing increase in available dental manpower will only fuel the public perception of dentistry as a convenience or a commodity, and not as a service, or luxury service to be valued. What this means to you out there, Mr. Dentist, is that to succeed in Dentistry as a Business you need to make your Office, your Business stand out from the crowd, so that when it comes time for the public to seek dental services, it’s simply a matter of them knowing that yours is the Best Darn Dental Office in the Whole of Town!! So take action! Take action today! I’ve touched on this before in a previous blog, but it’s a point I feel needs to be mentioned again on its own. I don’t know about you, but I always enjoy visiting a business where employees and team members show enjoyment for their position and their roles. Along with this, it’s great to see employees interacting in a positive manner amongst themselves. Those of you who, like me, have visited and experienced the office tour at Zappos shoes will know exactly what I mean. One way to make your dental office different and stand out from every other dental office in your area is to work on and cultivate positive inter-staff interactions. Your patients and customers will immediately know and recognise that your people are different just by watching and observing how your team members treat each other with way more courtesy than anywhere else they ever go. And I don’t just mean in other dental offices they visit. I mean other businesses out there that your patients visit through the course of their week. You see, nobody likes to be ignored. As a customer we like to be recognised…. well, usually, most of the time. And we like to see happy employees at the businesses we visit and frequent, don’t’ we? One of the best ways to show your customers that your business is different is to make sure that whenever two employees pass in your office that they smile and pleasantly greet each other, especially when a patient or customer is in view. For example, imagine in your mind when one team member is escorting a patient down your hallway. Another team member is approaching in the opposite direction. What happens next? Make it a policy in your dental office that this passing of staff is always seen as a friendly encounter with a smile and a “Hello”, so that the patient sees a friendly exchange. What would the patient think if there was no exchange? I know I’d be horrified if I saw two staff members fail to acknowledge each other in passing. To me a silent passing is equivalent to a passing grunt. It’s just wrong! You see, to me it comes naturally, but it is a throwback from my exercising days. When I was a cyclist I would always waive and acknowledged my fellow cyclists whether we passed in opposite or same directions. It was like a cyclists’ *code*. As a walker, it’s the same. There’s a general code of respect to acknowledge, with a hand raise/wave and a brief short “Hello” or “Good Morning”. It’s just common courtesy. A smile received makes the receiver feel good, and it also makes the sender feel good. And think about it. To do the contrary, to purposefully look the other way, to consciously ignore someone, takes a heck of a lot of effort and is really downright rude. Now on the street, walking for exercise, there’s a good chance that the person you pass lives nearby, and also exercises as well so there is some commonality. The same is said about dog walkers, who also have some commonality there. So in the office the commonality should be there as well, shouldn’t it? It’s funny, because I recently attended a weekend conference where the whole Hotel was booked out by our Dental Office Corporation Owner. What this meant was that every hotel guest was either a dentist who had sold their practice to the Corporation, or were in the dental industry selling to those dentists. I was surprised when walking between venue facilities and also my room [and there was a fair bit of walking], in passing other attendees, how many people turned the other cheek, rather than smile and say “hi”. It was a high enough percentage to notice that, out there, there is still a problem, I believe. It heartened me, as a Dental Coach, to see that this is the attitude of such a noticeable number of the Practice Principal Dentists. Because if this is their attitude away from their practice among people with commonality, then it’s probably a non-existent policy that exists within their dental office as well. And that gives me, as a Dental Coach, opportunity to teach dentists how to spread the love… and believe me, spreading the love is easy. WHAT GETS MEASURED GETS IMPROVED UPON – Five Simple Lessons You Can apply to Immediately Improve Your Dental Business NOW!! I like to walk. Fast. At pace. Powerwalk!! And last week while on a walk, I got to thinking. You see, I measure my walks. My times, and my paces. During, and after. So I was thinking, as you do. And what I thought was that the effect of measuring my walking times and performances is a metaphor for measuring your dental office collections and productions. You, see, annually I like to enter the Sydney City2Surf, a fourteen kilometre *BIG* event from Sydney to Bondi Beach. Each of my daily walks is focused on improving my pace and time for the next City2Surf. 2013 will be my fifth [in a row] City2Surf. My first two entries were 2:13 and then 2:09. So my goal became to break two hours. Around home I measured a half hour route, two one-hour routes, and even a 14km two-hour route. But I could never get anywhere near two hours no matter how hard I tried. Until…. A patient told me to download an app for my iPhone…so I chose Imapmywalk. This app gives you up to date time, distance, and pace statistics. Immediately my times started to improve. And so, as I said, it got me thinking. The effect of measuring my walking times and performances really is a metaphor for measuring your dental office collections and productions. Goals.You need to have a goal. Without a goal you’re guessing. You’re living a fantasy. Hoping for a result is true folly. When you have a goal you have a target. In your dental office you need to have production goals. Firstly you need to know how much you need to pay the bills of the practice. Then on top of that you need to know how much you need to pay yourself to live, as well as hoe much you need to have for return on investment and also how much you need to be putting away for your future as well as the future of your business.Too many dentists I know seem to get to the end of the year and “see how they went”. This is so wrong. Seeing whether “we had a good year” or not is no way to plan a business or plan a life. Throw that “plan” away. TrackingWhen walking, I learned to quickly divide my hour into tenths [six minute increments] and twentieths [three minute intervals] and then allocate appropriate distances to those time intervals. I knew where I was at any multiple of three or six minutes throughout my walk, thanks to my GPS app.Similarly, you need to then divide your dental year into number of days you are planning to be working for that year. In advance. This should be fairly easy to do. It is courteous toy your clients and patients when scheduling advance hygiene visits to know whether you will be there, or on vacation. Sure some conferences or seminars come up. But on the whole, you know.Once you know the number of days that you plan to work then you can divide your annual collections goal by your annual number of days to work to arrive at your dental office daily collections goal.You can then divide this number by the hours worked each day to arrive at your hourly collections goal. With this number in mind, you can then plan your dental day. There will always be uphills and downhills.Unless you’re walking on a track, you’re walking up and down hills. My brother was a track and field runner in his day. And a good one. He believed that running cross-countries was what they made you do in hell. But I beg to differ. You need the hills. It is the uphills that make you stronger.Correlating this back to the dental office day, there will be different procedures that earn different fees and therefore different hourly rates for your production.Planning your appointment book template to achieve your daily goal will have a balanced mix of procedures that are high production and lower production [downhills and uphills]. Start strong to stay strong.I found when walking, that the faster my first six minutes was, the easier it was to maintain, and then achieve a great pace for my one-hour and two hour walks.This is contrary to marathon and distance racing, where the motto is to pace yourself and finish strong down the straight.I found that when I started strong, it gave me a goal to maintain, whereas when I started slow, it was difficult to lift the overall average rate.Applying this to the dental office I believe on a daily basis it is better to start strong. Book your high production appointments early in the day. Start your day with those high production appointments.. Hitting your daily goal early in the day provides a sense of achievement for you, your office and your team. Conversely, finishing a long day with a number of high production appointments can be draining. In walking, it was easier to lift an earlier set higher average pace in small increments during the walk rather than try and drag up a lower average pace later in the walk. AdaptationWhen I travel, things are different. Sometimes there is weather or traffic [like NYC] and sometimes weather and pollution [Macau]. In Venice there was no traffic, but lots of bridges with short stairs.In Dentistry, there will be adversity. Stay focused on your numbers, your daily goals, and your monthly and annual targets. If need be, during more difficult times, vary or add additional hours and days to make sure you hit your annual goal.